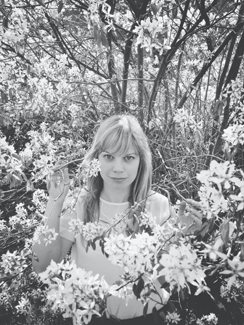 Anna Groth-ShiveOver the course of her first two records, Toronto’s Basia Bulat has crafted a musical persona built around folk-pop that can be as bare and affecting with the best of them, but really wins hearts when it’s upbeat and joyous and feels like a warm ray of aural sunshine. Assuming that her just-announced third album Tall Tall Shadow will simply offer more of the same, however, may be premature. She’s not going electronic or anything – well, maybe a bit but not so much that the Canadian indie-rock rulebook demands she assume a new identity – but advance word is that Shadow still represents a significant change in modus operandi. Howard Bilerman, who produced the first two records, has stepped aside for Arcade Fire’s Tim Kingsbury and Mark Lawson, who engineered The Suburbs; the piano was adopted as a primary composition instrument alongside or even over the guitar; a personal tragedy altered and informed the songwriting; and most importantly, Bulat challenged her own expectations about what she should or could sound like. The fruits of this creative process can be heard in full when Tall Tall Shadow is released October 1, but the first of the new songs – the album’s title track – is available to stream now. Exclaim has more album details and an expanded Fall itinerary, with more North American dates being added to the already-announced hometown show at the Polish Combatants Hall on October 10. CBC Music has premiered the new video from Two Hours Traffic’s latest Foolish Blood. They have an in-store at Sonic Boom in The Annex tomorrow afternoon, July 27, at 5PM. NOW and CBC talk to the Peter Dreimanis half of July Talk while The Halifax Chronicle-Herald gets a word with creative foil Leah Fay. Their next local show is up at Downsview Park as part of Edgefest next week, on July 31. Fractured Air interviews Tim Condon of Toronto’s new (neu?) Krautrock heroes Fresh Snow, who hold a record release show for their debut LP I at The Boat on August 8. In conversation with Billboard, Neko Case offers an update on the next New Pornographers record, which is apparently almost done. You probably shouldn’t expect either her or Dan Bejar to be on hand when they play a show at the CNE Bandshell on August 17, though. Just in case you were. American Songwriter has premiered the stream of another new track from the new Sadies record Internal Sounds, out September 17. The Daily Swarm and Sydney Morning Herald talk to Devon Walsh of Majical Cloudz, back in town on September 17 at Wrongbar. Having made their mark over the last couple of years with one album far too long in the can before being let loose and another covering a ’70s prog-rock classic, Toronto’s Darcys are finally able to announce the release of an album that might actually represent where they are today. That record will be called Warring, it will be out on September 17, and courtesy of Spin, you can stream the first track from it right now or get it to download from the band’s website in exchange for a little social media juice. In conversation with Billboard, James Murphy offers his thoughts, as sorta producer, on the new Arcade Fire record. It’s out October 29 and Murphy, incidentally, is doing a DJ set at The Hoxton on September 6. If watching guys DJ is your bag. Chris Murphy tells Exclaim that the next Sloan record will be that long-awaited, presumed-inevitable thing – a double-album with each side essentially a solo record for each member. There’s no firm release plans yet, but what is known is that Jay Ferguson’s side will be getting worn out first. No question. Bronson Island have posted a video session dating to who knows when with the now on-hiatus Broken Social Scene performing a previously-unreleased song. Damian Abraham of Fucked Up talks to Clash about his approach to performing live. CBC Music has a Summer check-in chat with Sarah Harmer.